This pasta dish, a standby in our house, is the kind of supper you can throw together in a flash. I try to keep a steady supply of breadcrumbs in the freezer by turning surplus bread into crumbs. Our pantry generally has a few cans of good-quality anchovies, and if there’s no parsley in the garden, I try to have some in the refrigerator. Start a large pot of water boiling for your spaghetti. When the water is boiling, salt it generously and add the spaghetti. While the water is heating up, heat 2 tablespoons of the olive oil in a sauté pan. When it's hot, add the breadcrumbs. Toast the crumbs over medium heat until golden, about 8 minutes. Set aside in a dish. While the spaghetti is cooking, heat the remaining 2 tablespoons oil in the sauté pan. Add the chopped garlic and cook briefly for 30 seconds or so, being careful not to burn the garlic. Add the anchovies. With a wooden spoon, immediately start smashing the anchovies against the pan and into the garlic. They will quickly turn into a thick paste. Turn off the heat and set aside. When the spaghetti is cooked, drain it, reserving a cupful of hot pasta water. Add the pasta to the anchovies, then add the parsley and toss. If the pasta seems drier than you’d like, add a few spoonfuls of the pasta water. Add several grinds of pepper and salt to taste — although because the anchovies are salty, you probably won’t need much extra salt, if any. Pass the breadcrumbs at the table, letting everyone sprinkle on as much extra as they’d like. Because this dish depends on the anchovies, buy the best available. I don’t usually use the oil from the anchovies; if you decide to add some, taste it first and be sure it’s a good-tasting olive oil. Double the recipe and save the leftovers for the next night. With a few eggs, you can turn the leftovers into a delicious spaghetti frittata. Culinate editor's note: Sunset magazine has a very similar recipe for spaghetti con acciughe e mollica_ that incorporates spicy chiles and notes that this dish is traditional in Calabria as part of the Christmas seven-fishes feast. 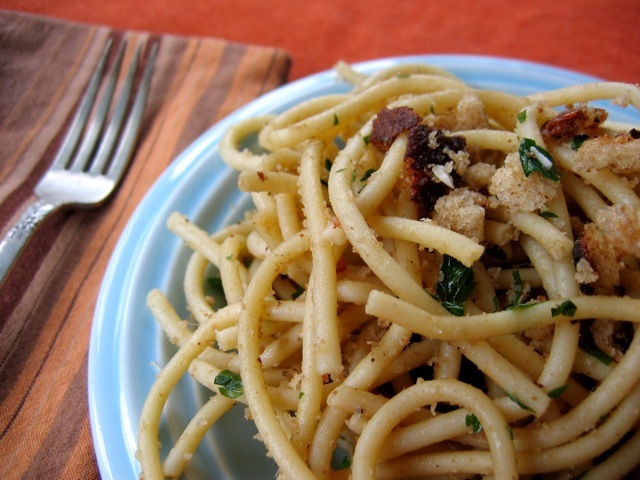 Lynne Rossetto Kasper's Friday-Night Spaghetti with Tuna and Black Olives is very similar, too. Soft roasted garlic makes a delicious paste when mashed with the anchovies. Vary this dish by swapping good-quality canned tuna for the anchovies and fennel fronds for the parsley. Cooked white beans are also nice, as are capers, fresh tomatoes, and lemon zest. Read more about family suppers in Giovanna Zivny's "Teaching the kids to cook."